We propose a software reliability growth model with testing-effort based on a continuous-state space stochastic process, such as a lognormal process, and conduct its goodness-of-fit evaluation. We also discuss a parameter estimation method of our model. Then, we derive several software reliability assessment measures by the probability distribution of its solution process, and compare our model with existing continuous-state space software reliability growth models in terms of the mean square error and the Akaike’s information criterion by using actual fault count data. Quantitative software reliability assessment is one of the important activities to produce reliable software systems. A software reliability growth model (abbreviated as SRGM) [1,2] is known as a useful mathematical tool for assessing software reliability quantitatively. The SRGM can describe the software fault-detection phenomenon or the software failure-occurrence phenomenon in the testing or operational phase by applying stochastic and statistical theories. 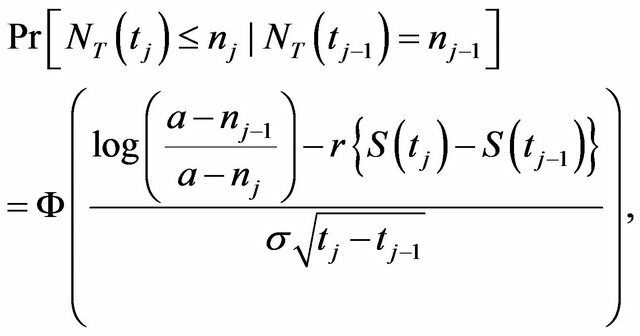 Especially, a nonhomogeneous Poisson process (abbreviated as NHPP) [3,4], which describes the faultdetection phenomenon as a discrete-state space, is often applied in software reliability growth modeling by supposing an appropriate mean value function of the NHPP. Accordingly, the NHPP model is utilized for quantitative software reliability assessment in many software houses and computer manufacturers from the view point of the high applicability and simplicity of the model structure of an NHPP. In contrast with discrete-state space SRGMs, such as well-known NHPP models , there are continuousstate space SRGMs to assess software reliability for large scale software systems. Specifically, Yamada et al. discussed a framework for the continuous-state space software reliability growth modeling based on a stochastic differential equation of Itô type, and compared the continuous-state space SRGM with the NHPP models. Recently, Yamada et al. and Lee et al. proposed several type of the continuous-state space SRGMs based on stochastic differential equations of Itô type, such as exponential, delayed S-shaped, inflection S-shaped stochastic differential equation models, by characterizing the fault-detection rate per unit time per one fault, respectively. However, these continuous-state space SRGMs have not taken the effect of testing-effort into consideration in software reliability assessment. The testing-effort, such as the number of executed test-cases, testing-coverage, and CPU hours expended in the testing phase, is well known as one of the most important factors being related to the software reliability growth process . Under the above background, there is necessity to discuss a testingeffort dependent SRGM on a continuous-state space for the purpose of developing a more plausible continuous-state space SRGM. This paper proposes a continuous-state space software reliability growth model with the testing-effort factor by applying a mathematical technique of stochastic differrential equations of Itô type, and conducts goodnessof-fit comparisons of our model with existing continuous-state space SRGMs. Concretely, we extend a basic differential equation describing the behavior of the cumulative number of detected faults to a stochastic differential equation of Itô type by considering with the testing-effort factor, and derive its solution process which represents the fault-detection process. Then, we discuss estimation methods for unknown parameters in our model. And we then compare our model with existing continuous-state space SRGMs in terms of the mean square error (MSE)  and Akaike’s information criterion (AIC) . Finally, we derive several software reliability assessment measures by the probability distribution of the solution process, and show numerical examples for software reliability assessment measures derived from our model by using actual fault counting data. where b(t) indicates the fault-detection rate at testing-time t and is assumed to be a non-negative function, and a the initial fault content in the software system. Equation (1) describes the behavior of the decrement of the fault content in the software system. where indicates a positive constant representing magnitude of the irregular fluctuation and a standardized Gaussian white noise. 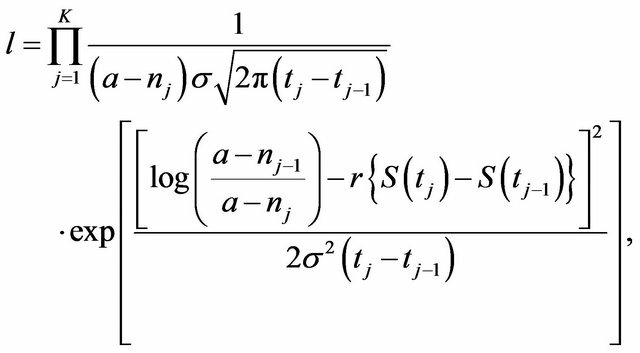 We develop a continuous-state space SRGM with the effect of testing-effort factor based on stochastic differential equations which follow the lognormal process. The testing-effort, such as the number of executed test-cases, testing-coverage, and CPU hours, is one of the important factors influencing on the software reliability growth process in an actual testing-phase. Therefore, the testing-effort should be taken into consideration in continuous-state space software reliability growth modeling. We should specify the testing-effort function s(t) in Equation (8) to utilize the solution process in Equation (9) as an SRGM. where is the total amount of testing-effort expenditures, the scale parameter, and m the shape parameter characterizing the shape of the testing-effort function. 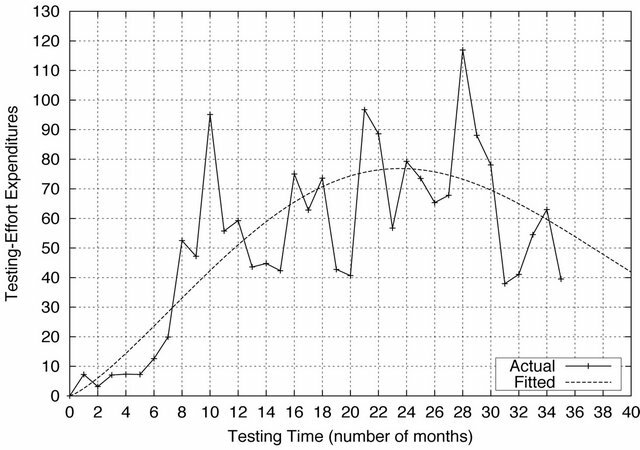 The Weibull curve function has a useful property to describe the time-dependent behavior of the expended testing-effort expenditures in the testing-phase approximately because of its flexibility. For examples, we can obtain the exponential curves when m = 1 in Equations (11) and (12). And when m = 2, we can derive Rayleigh curves. That is, the Weibull curve function is a general type model, which includes the exponential and Rayleigh curve functions. 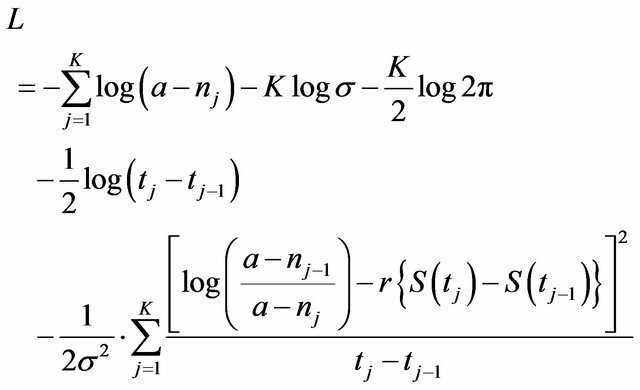 We discuss estimation methods of unknown parameters of the testing-effort function in Equation (11) and the solution process in Equation (9), respectively. Now we suppose that K data pairs with respect to the total number of faults, detected during the time-interval and the amount of testing-effort expenditures, , expended at are observed. We derive several software reliability assessment measures, which are useful for quantitative assessment of software reliability. Especially, we derive instantaneous and cumulative MTBF’s in this paper. 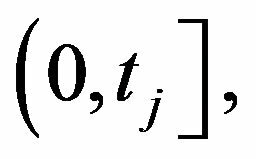 The instantaneous MTBF in Equation (25) can be calculated by substituting Equation (27) into Equation (25). If the instantaneous MTBF in Equation (25) and the cumulative MTBF in Equation (28) take on a large value, respectively, then it enables us to decide that the software system becomes more reliable. We show results of goodness-of-fit comparisons of our model with other continuous-state space SRGMs [6-8], such as exponential, delayed S-shaped, and inflection S-shaped stochastic differential equations, in terms of the mean square errors (MSE)  and Akaike’s Information Criterion (AIC) . Regarding the goodness-of-fit comparisons, we use two actual data sets  named as DS1 and DS2, respectively. DS1 and DS2 indicate an Sshaped and exponential reliability growth curves, respectively. 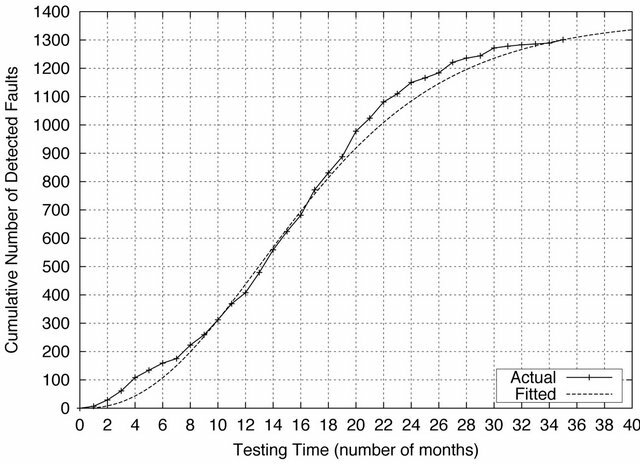 where denotes the estimated value of the expected cumulative number of faults by arbitrary testing time . Accordingly, the model which indicates the smallest MSE fits best to the observed data set than other models. We should note that the AIC values themselves are not significant. The absolute value of difference among their values is significant. We can judge that the model indicating the smallest AIC fits best to the actual data set if their differences are greater than or equal to 1. If the differences are less than 1, there are no significant. Table 1 shows the results of model comparisons based on the MSE and the AIC, respectively. The model comparisons based on the AIC is not significant only for DS2, however, we can see that our model improves a performance of the MSE and the AIC respectively, compared with other continuous-state space SRGMs discussed in this paper. Table 1. Results of model comparisons. We show numerical examples by using testing-effort data recorded along with detected fault counting data collected from the actual testing. In this testing, 1301 fault are totally detected and 1846.92 (testing hours) are totally expended as the testing-effort within 35 months . Figure 1. Estimated testing-effort function. Figure 2. Estimated expected number of detected faults. Figure 3. 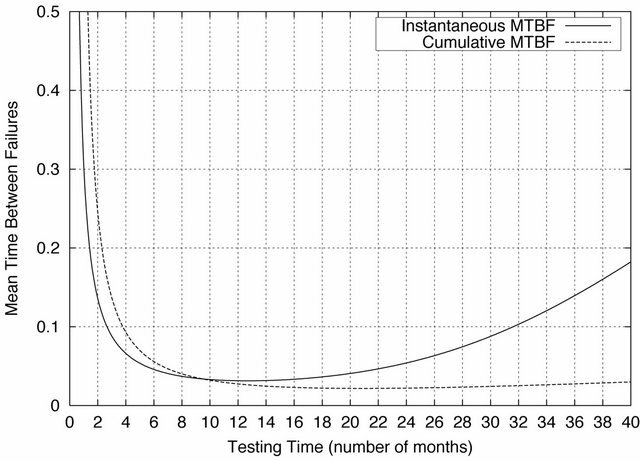 Estimated instantaneous and cumulative MTBFs. incorporate information of the past software reliability growth process as shown in Equation (25). We can estimate the instantaneous MTBF at the termination time of the testing, , to be about 0.1297 (about 4.5 months), and also, the cumulative MTBF, , to be about 0.0269 (about 0.9 months). We have discussed a continuous-state space SRGM with the effect of testing-effort by using a mathematical technique of stochastic differential equations and its parameters estimation methods. Then, we have compared performance in software reliability measurement of our model with existing continuous-state space SRGMs in terms of the MSE and the AIC by using actual data, respectively. Finally, we have also shown numerical illustrations for the software reliability assessment measures, such as the instantaneous and cumulative MTBFs. We believe that software developing managers can get information on a relationship between the attained software reliability and the testing-effort expenditures by using our software reliability growth model. And our model also enables software development managers to decide how much testing-effort are expended to attain a reliability objective. Further studies are needed to examine the validity of our model for practical applications by using many observed data. The second author is supported in part by the Grant-inAid for Scientific Research (C), Grant No. 22510150, from the Ministry of Education, Culture, Sports, Science and Technology of Japan. H. Pham, “Software Reliability,” Springer-Verlag, Singapore City, 2000. K. S. Trivedi, “Probability and Statistics with Reliability, Queueing and Computer Science Applications,” John Wiley & Sons, New York, 2002. S. Yamada, M. Kimura, H. Tanaka and S. Osaki, “Software Reliability Measurement and Assessment with Stochastic Differential Equations,” IEICE Transactions on Fundamentals of Electronics, and Computer Sciences, Vol. E77-A, No. 1, 1994, pp. 109-116. S. Yamada, A. Nishigaki and M. Kimura, “A Stochastic Differential Equation Model for Software Reliability Assessment and Its Goodness-of-Fit,” International Journal of Reliability and Applications, Vol. 4, No. 1, 2003, pp. 1- 11. B. Øksendal, “Stochastic Differential Equations: An Introduction with Applications,” Springer-Verlag, BerlinHeidelberg, 1985. W. D. Brooks and R. W. Motley, “Analysis of Discrete Software Reliability Models,” Technical Report RADCTR-80-84, Rome Air Development Center, New York, 1974.